Having originally written here that Terry had put away his drums, he took them out once again in February 2007 when Pentangle re-united at the BBC Radio 2 Folk Awards to receive a Lifetime Achievement Award from Sir David Attenborough. Terry told the Times newspaper, that prior to this year he hadn't touched his kit for ten years, "People have been trying to reassure me that it's like riding a bike. But that's no good really. I've never ridden a bike in my life." A CD box set 'The Time Has Come' covering the group's six years together, and an accompanying book, was subsequently released. The band also told the Times that they are open to getting back together for a short series of dates. Congratulations guys!. (Click here to go to the Times website to read 'Five Sides To Every Story', the full Times article on Pentangle) [then use your back arrow to return to this site]. Terry played drums with the Fairweather-Brown All Stars from 1962 to 1964 and then joined Alexis Korner before moving on to form Pentangle. Terry and his wife Jill moved to Menorca in 1970 and Terry 'commuted' to play in support of Charles Aznavour before putting away his drums and opening the restaurant Pan Y Vino. Terry has now given up the restaurant, has taken out his drums again, and is playing and composing new songs. 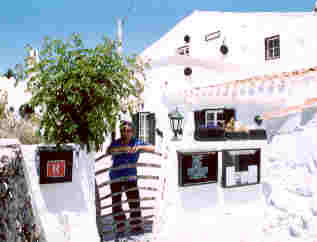 Terry continues to live in Menorca where in 2009 he gave a concert with Spanish friends to highlight the condition 'Bipolar Disorder' (referred to at one time as Manic Depression). It is not known to most people that Terry has had the disorder for many years. "I gave the concert in order to try and break the taboo perceived by many people," says Terry. "I was motivated by two reasons, firstly to inform people of this condition affecting 1 in 10 worldwide, and secondly to repay Menorca for giving our family a magic life. If, as in my case, you are lucky enough to find something you love, concentrate on that (not easy!). Click here fo find out more about Bipolar Disorder. There are a number of other information sites on the internet and others who have had the disorder include Mel Gibson, Nina Simone, Jaco Pastorius and Stephen Fry. Terry has a website at www.terrycoxdrums.com. You can download samples of various numbers, and there is a link to a video clip (you may be invited to download Windows Media Player 11 to run it). 2011 - For those who have been wondering what drummer Terry Cox has been up to since the reunion of Pentangle, he has been recording a few videos from a live concert at Es Forat in Menorca where he now lives. Sergi Martin is on guitar and Nito Llorens is on double bass. Click here to see the videos. Click here for more about Terry. 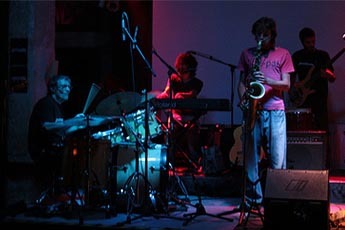 Terry with his band Jambient. Photo courtesy of Terry Cox. Terry will also be playing three UK gigs this year with Pentangle. He says: 'We in the shape of Pentangle (original members) are playing Glastonbury on June 25th; Cambridge on July 30th and the Royal Festival Hall on August 1st. Having made it to 74 this is a marathon. I play about once a week with various trios which all include very good guitar players who divide their time between Barcelona & Menorca keeping the old man happy'. Sadly, in March 2015, John Renbourn guitarist and co-founder of Pentangle passed away.